This fruit basket is a perfect gift for your Valentine! Are you still trying to figure out how to make this Valentine’s Day special? I have gifts covered in chocolate, shaped like hearts and filled with lots of love. The best part is the price! We’re doing a Smart Shopper Deal of the Day with Fruitbouquets.com . 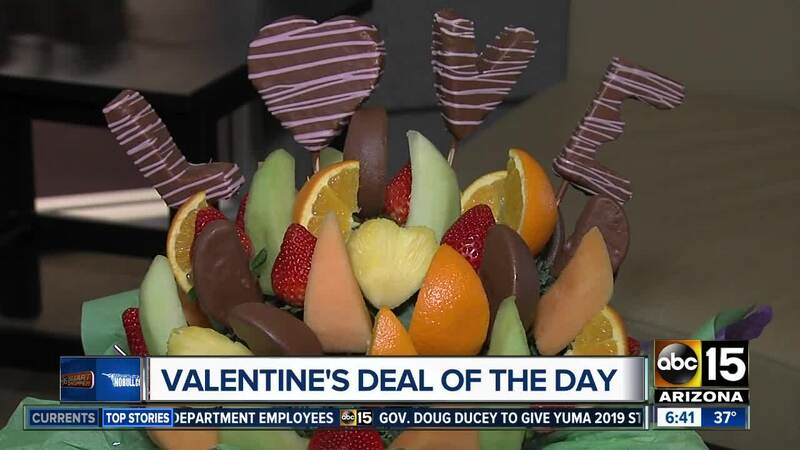 They have mouthwatering options of hand-crafted arrangements with all sorts of fruit, including strawberries, melons, grapes, even pineapples and oranges. They can be dipped in different types of chocolate, carved into all sorts of shapes... And you don't have to pay full price. Go online starting right now and get $20 off sitewide on products that are $39.99 or more. You'll need to use the promo code "SWEETFRUIT" and you have until February 14 to get this online deal. So, whether you need a gift for your significant other, or yourself, you'll get a berry good deal.